After spending the past few days sorting my crafty stash I actually made something today!!!! 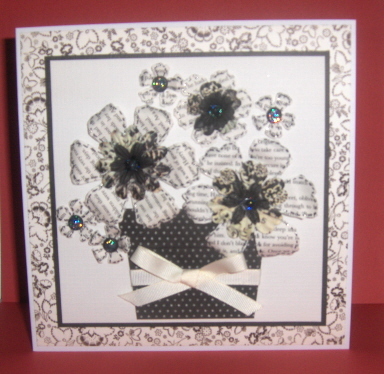 I used a small piece of the American Crafts Ribbon, Craftwork cards Candi, Prima flowers and some TH die-cut tattered flowers which were sent to me by a fabulous FB friend. It's the first time I've used die-cuts by TH and must say I am quite looking forward to seeing what he brings with him next month! Now going to raid my bookshelf to see which of my books I can sacrifice for more die-cutting! This is just gorgeous and those flowers look fabulous. I love the papers too.